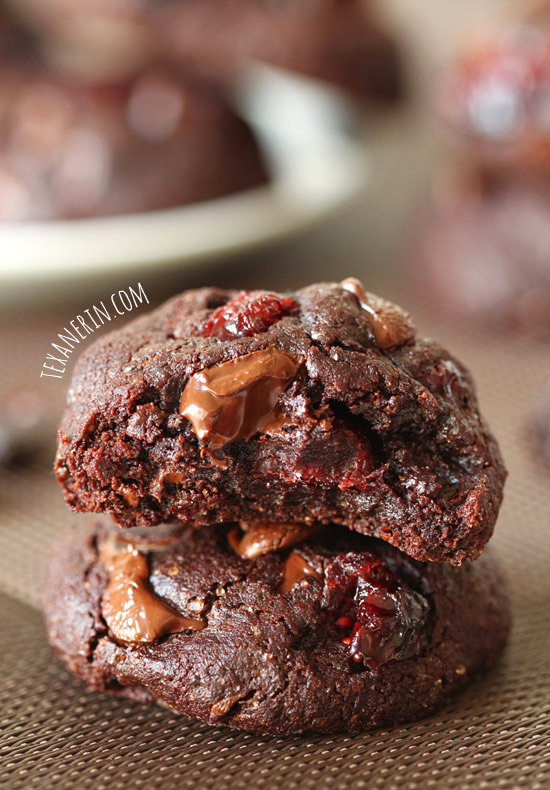 These double chocolate cherry cookies are incredibly dark and soft, with bursts of tartness thanks to dried tart cherries! I was asked to participate in the National Cherry Month #GoTart Campaign as a member of the Healthy Aperture Blogger Network. I was compensated for my time but the opinions expressed are, as always, my own! The dried tart cherries add the nicest little bursts of tartness! And as a bonus, they make these 100% whole wheat (and dairy-free!) double chocolate cookies rich in Vitamin A. I used semi-sweet chocolate but you can use dark chocolate, if you like. I prefer eating these straight from the oven when they’re warm and gooey but if you have any leftovers the day after baking, I really recommend popping them in the microwave for 10 seconds. Weirdly enough, my husband prefers them at room temperature and liked how they hardened up a little on the second and third days. These cookies have a lot more sugar than I usually use but after trial after trial of not-so-nicely-texture double chocolate cookies, I just went with the sugar. If you want non-cakey cookies, you just have to go with it! I think these are perfect year-round cookies. Wishing for the summer in the winter? Tart cherry cookies. Like the red theme for Valentine’s Day but don’t want to use food coloring? Make these! Have fresh tart cherries in the summer? I haven’t actually tried it but it at least sounds interesting! 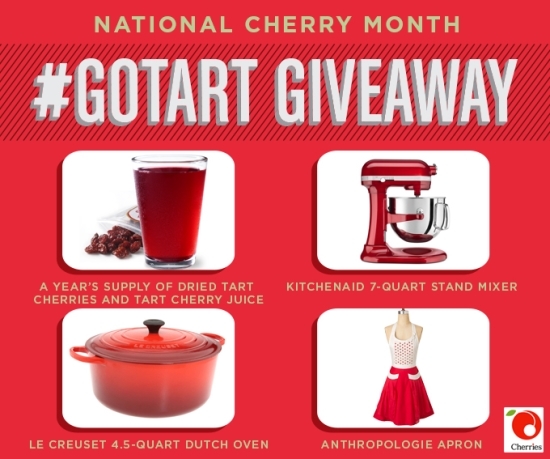 And look, the Cherry Marketing Institute is sponsoring this amazing giveaway! One winner will win this Taste Giveaway Prize Pack (a $1500 value!). Use the Rafflecopter below to enter! It ends at 11:59PM EST on February 27, 2014. It’s open to US residents, 18 and older. To learn more about going tart and to find recipes and serving ideas for tart cherries, visit Choose Cherries. Preheat the oven 350°F (176°C) and line a baking sheet with a piece of parchment paper. In a medium bowl, mix together the flour, cocoa powder and baking powder. In a large microwave safe bowl, melt the coconut oil. To the melted coconut oil, add the sugar, honey, vanilla and eggs and stir until well combined. Let it sit for 5 minutes to let the sugar dissolve. Add the dry mix to the wet and stir until well combined. Stir in the chocolate chips and dried tart cherries. Roll into 24 1-1/4" balls and place them 2" apart on the prepared baking sheet. Press the balls down with the palm of your hand. Bake for 6-8 minutes or until the cookies appear set in the middle. Do not over bake! Let the cookies cool for two minutes on the baking sheet and then remove to a wire rack to cool completely. You can use unrefined coconut oil if you don't mind the coconut taste. 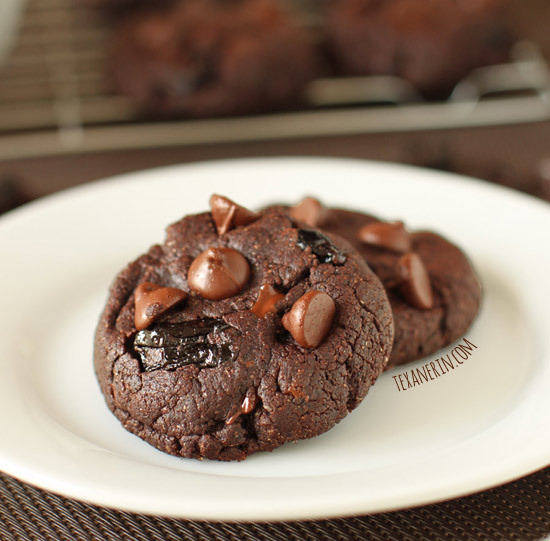 89 comments on “Double Chocolate Cherry Cookies (whole grain, dairy-free)” — Add one! I made them a second time and chopped up the cherries to make sure that they were more evenly distributed in the cookies. That was my husband’s only complaint the first time around – even better! Mmm! I love them in curry! I make a pumpkin curry with dried tart cherries in it and it is PHENOMENAL! That’s such an interesting combination! These cookies are really making me wish I wasn’t paleo right now!!! Or lunch or dinner or whenever. ;) Love muffins! I love cherry cordial chocolates and cherry garcia ice cream and cherry pie… I just love cherries! Cordial chocolates?! Checking those out. Never heard of them! I love tart cherries in granola with some dark chocolate thrown in there too! Delicious on top of Greek yogurt! Erin replies to Maura C.
Tart cherries are *hands down* my favorite dried fruit to bake with because I’m a girl who can eat, like, 10 chocolate truffles in one sitting and not be overwhelmed by the richness (or the onlookers’ stares of horror). I’m all about big flavors in small packages. I usually throw dried cherries into my banana/oat/peanut butter/applesauce “healthy cookies” or use them in homemade trail mixes, but I subbed them for dried cranberries in a full-sugar cookie recipe once and nommed nommed nommed all the way home (http://armypantsandflipflops.com/2012/11/19/thanksgiving-care-package-turkey-liver-disclaimer/). Haha. Same here. I hate reading recipes where the author writes stuff like, “These were so good that I ate three. They were that good.” And then I go and eat 14. Apparently I have no self control. ;) Going to go check out your post! These look absolutely incredible. I love the health benefits of unrefined coconut oil (plus the taste), so I plan to use that, instead. What a great blog; I look forward to many more recipes. Thank you! :) I hope you’ll enjoy the cookies and the other recipes! This looks so good. Can’t wait to try! cherries and chocolate are the perfect combination! These cookies look and sound so amazing. I can’t wait to get them in the oven. Thank you so very much for sharing. These cookies look amazing…I can’t wait to get them in the oven…thank you so very much for sharing! Can’t wait to try this recipe. The cookies look delicious! These cookies look SO good. I love using dried tart cherries in salads and granola! I LOVE tart cherries in cookies! I have never added them with dark chocolate…only white. I am definitely making these! WOW – these cookies are just jumping off the screen and look simply divine!!! I like them in granola! JUST PURCHASED A BAG, PLANNED ON MAKING CHERRY ALMOND SCONES. GUESS I’M RETHINKING THAT. NEED DAILY DOSE OF CHOCOLATE……LOL. The choco-holic in me NEEDS these right now! What a gorgeous, gooey cookie, Erin! Love your recipe. I’ve never tried that but it sounds amazing! These look delicious! :) I enjoy cherries in my granola in the morning. Awesome sauce! A nice way to introduce cherries to my baking! I made banana bread yesterday with dried cherries and chocolate chips – YUM!! These cookies look unbelievable! Seriously amazing! 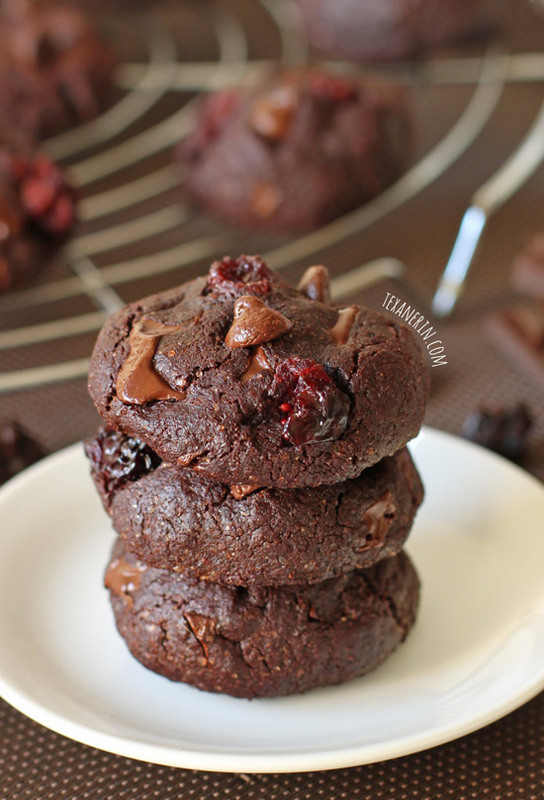 I love anything with chocolate and cherries, these cookies are just what my afternoon needs! I like dried cherries in a salad. These sound and look delicious! Why did I chose to go paleo? Just kidding. I may be making these for my nonpaleo eating family members, I am sure they will love them. Haha. Sorry, Hannah! I’ll have some grain-free goodies coming up soon. :) I hope your family will like the cookies! I would love these in cookies, muffins, or a bread. These look amazing, Erin! I made something similar last weekend, but faaaaar from healthy ;) Can’t wait to try your version! AWESOME looking cookies! Can’t wait to make for office!!!! Erin replies to Colleen @ What’s Baking in the Barbershop? !